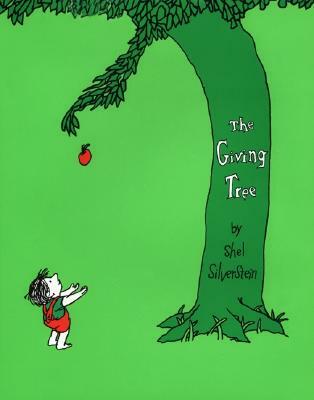 reading Shel Silverstein's The Giving Tree to Hollis for the first time several months ago, I recall being struck by the moment where the young boy climbs the tree. my first thoughts ("why that's dangerous!") quickly evaporated to a more reflective question: how could it be any more dangerous today than it was then? certainly the relative bone-density of today's children is roughly the same - no major evolutionary change has gone on during the last 30-odd years, and we're just as durable and/or fragile now as we were then. i concluded a little simplistically at the time that what was going on was social and moral: pressures from different sources (like an increasingly sensationalized media) were contributing to convincing us parents that ensuring a more protective zone is a necessity in an increasingly uncertain world. drawing on this conclusion, and upon my own beliefs in emancipatory educational thinking (the work of Paulo Freire mostly), i vowed to be more conscious of my hovering, to step back more often, and to resist the urge to protect; to see this urge as rather another way to obscure from my child a vision of freedom and justice. Gill's book helps clarify this rather vague set of premises. 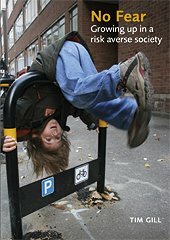 His understanding and categorization of different levels of risk, the long-term consequences (or side effects) of structuring acts based on risk-aversion (such as risk-compensation), and his anecdotes of extremely inappropriate (though, fortunately, just as extremely rare) responses to seemingly risky behaviours are interesting and useful. His notions of a child's resilience are especially interesting to ponder, and echo strongly for me of the thinking of Loris Malaguzzi and the Reggio philosophy - in particular, our responsibility to have faith in the abilities and capacities (cognitive as well as physical-spatial) of our children as we plan our encounters with them in and beyond the classroom. Most interestingly, perhaps, is the purpose of the book: it's not self-help parenting, but a policy book, guided to community change. As such, the focus is not merely on changing parental behaviour, but on changing social structures more broadly. Gill's suggestion is to shift from philosophies of protection to those of resilience, in all manner of social and public institutions: child care settings, urban planning, municipal or regional children's services organizations, state legislation, and so on. Gill is unabashed about declaring such change as fundamentally radical throughout his text. In an age of (supposed) austerity, demands for change - possibly costly change - may make some feel uncomfortable, but should hopefully pose a challenge to us all to consider how creating a world in which we will want to live - a more just, egalitarian, and inclusive world - will rest principally upon those who will inherit that world. The challenge, in my mind, is to focus less on responding to the risk our individual children face, and more on the social and cultural situations that expose our children to risk in the first place. To address social failings as social, and not as personal, requires a radical but necessary shift. To demonstrate that we, as parents, are capable of making that shift is an important first lesson for achieving that world. Gill's book gives us a good grasp of the language and tactics for putting such a lesson into practice.